Japanese curry is very popular in Japan due to being cheap, easy to make and extremely tasty. 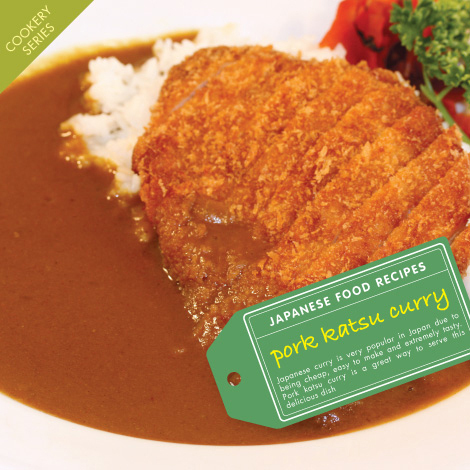 Pork katsu curry is a great way to serve this delicious dish. Curry is also extremely versatile in that you can add a variety of toppings and ingredients such as tempura, natto and even cheese. You can buy many of the ingredients at Japan Centre, just click on the link and add it to your basket. Feel free to leave any comments or tips at the bottom. • Optional Ingredients: Cheese (as a topping), Natto (instead of meat – available in Japan Centre frozen section), Curry Powder (for extra spice). 1. Start by cutting the onion, potato and carrot into small chunks. 2. Add the onion, potato and carrot to a large pan and then fill the pan approximately half-way with water. 3. Bring the water to boil and then simmer for 20 minutes or until vegetables are softened. 4. It is good to start the preparation of rice now. Use 1-1.5 cups of rice with the appropriate amount of water and cook for about 20 minutes. 5. Prepare the pork by removing all the fat and seasoning with salt and pepper. 6. Coat the pork steaks with plain flour, cover with raw, beaten egg and then dip in the breadcrumbs before deep-frying in the vegetable oil. 7. Add 3 to 4 blocks of curry roux to the vegetables and water and simmer for a further 10 minutes. Keep mixing until the curry sauce is thick and smooth. 8. Finally, slice the cooked pork katsu into strips and lay over a bed of rice before adding the curry sauce. Then garnish with the pickled radish and enjoy! Looks delicious! Will there be a printable PDF file available like on the other recipes? I’ve made this 🙂 I love your website!